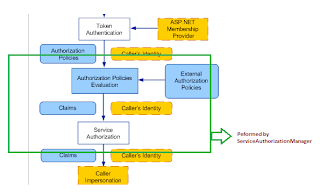 In the previous posts, we have seen two possible options of authorization / access control including PrincipalPermission and directly using ServiceSecurityContext for authorizing users from the same active directory domains. With PrincipalPermission() we need to provide the security logic on each service operation with an option of using PrinicipalPermissionAttribute. Using ServiceSecurityContext, we included the authorization logic in service operation code which makes it convoluted. What if we need to only authorize certain users for the service i.e. all operations of the service. The feature can be implemented by using the extensibility features in WCF. We can use ServiceAuthorizationManager for the same. As we can see that there are two overloads of CheckAccess() method. 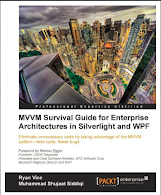 Additionally, there are two virtual methods CheckAccessCore() and GetAuthorizationPolicies(). If we dotPeek the code, we can verify the flow described by the MSDN document. As you can see that it iis first calling GetAuthorizationPolicies() and then after using the authorization policies to create a ServiceSecurityContext, it is using the CheckAccessCore() method. The default implementation of CheckAccessCore() is PERMIT ALL i.e. it returns true, we can override this to perform the required authorization. 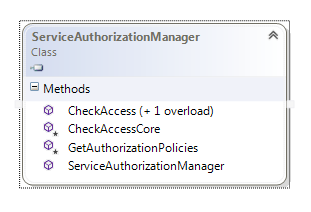 In order to understand it further let us add a custom definition of ServiceAuthorizationManager. It is non-sealed so we can directly inherit from it and override the virtual members. Based on the code flow of CheckAccess() described above, we just need to override CheckAccessCore() and GetAuthorizationPolicies() methods. For now, let's just use the logic provided by the base class i.e. ServiceAuthorizationManager. Now in order for the service to use this, we must add this behavior, let's update the App.Config. As you can see we are still using WindowsGroups as the principal permissions. We would be providing the actual authorization using the same groups. In order to test that the service authorization manager is actually being used by the service. Add some breakpoints and execute the code, you should see that GetAuthorizationPolicies() is called first followed by CheckAccessCore() method. Now let us provide the same authorization logic we have provided in the last two examples. We only want subjects from Traders group to have access to our service. Since the same WCF pipeline is used for metadata requests as well, we need to first determine if this is such request. If so we can allow the operation. There is no user specific security information for metadata request including claims and domain groups. For other service operations as well, the header action is set accordingly. Let's execute the code, as you can see the authorization logic is correctly being used. Here we have provided the code for service level authorization logic. For more fine grained security based, we can use the request header actions. Doesn't quite work for me. Followed the tutorial but unable to get the Service Manager to hit any breakpoints. Tried implementing as a WCF Library and WCF Application both not calling the custom manager class. Tried this but can't seem to get the custom Service Manager to hit any breakpoints. Followed exactly what you did but have it hosted via a console application? Does not work in my case. Breakpoints are not being hit. Tried as a WCF Service Library and WCF Service Application and both instances fail to hit breakpoints? Onam, I might have forgot to discuss some stuff in the post. But can you download the sample project attached to the post and see if that is working for you? Let me know if that doesn't work for you and I can have a look at your project.